What to do with plastic bags and films? Chances are, a lot of plastic film comes into your home. Film packaging includes plastic grocery, shopping, and produce bags; bread, sandwich, and food storage bags; newspaper sleeves; dry-cleaning bags; “air pillows” used to cushion shipments, bubble wrap, and Tyvek envelopes; case wraps from cases of water, toilet paper, and paper towels; and wraps from around furniture and electronics. All of these materials are recyclable. However, when they end up in curbside recycling carts, they can cause problems. First, they are lightweight and tend to blow out as the carts are lifted and emptied. Second, at the materials recovery facility, plastic bags get caught in conveyor belts and other equipment. This can cause the entire sorting line to be shut down to remove tangled plastic film. So, please — check your local program instructions before adding to your curbside recycling cart or local recyclables collection bin. 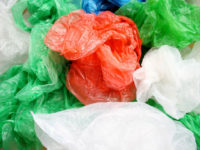 If plastic film cannot be collected at the curb or in a local drop-off collection bin, recycle your plastic film and bags at a local grocery store or other retailer that provides a bin. Many retailers, such as Lowe’s, Target, and Walmart stores, have bins for plastic film recycling. These are normally located near the front entrance of the store. If you don’t see a bin, ask Customer Service about bag recycling. Check to see if film plastic is accepted at other retailers in your area. Visit Plastic Film Recycling to search for locations near you. Remember — remove products, receipts, and crumbs before you drop off your bags for recycling! 2 Responses to "What to do with plastic bags and films?" You need to mention many Solid Waste Districts in Indiana also accept film plastics.. Thanks for the note. Are the Districts accepting them taking them at the curb or at drop-off facilities?